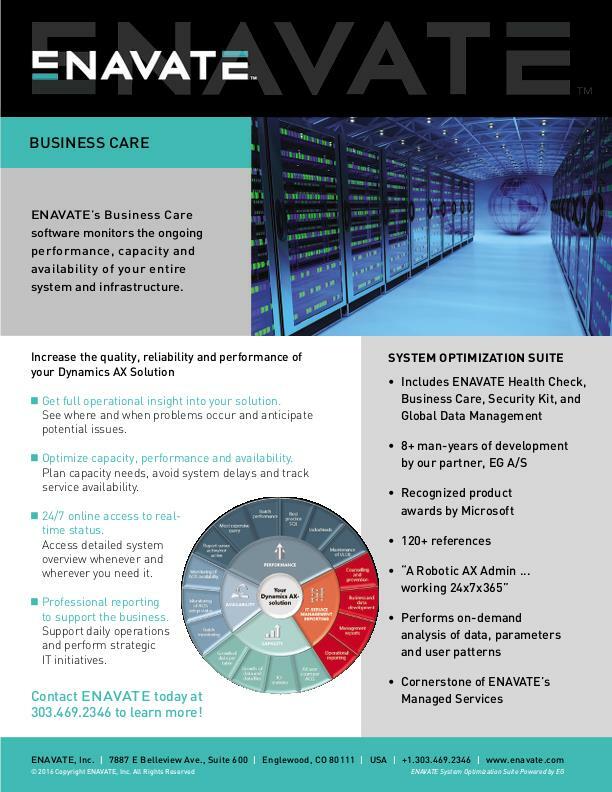 ENAVATE Business Care is a collection of services that reveal where and when problems occur in your Dynamics AX installation. You get overview and insight enabling you to beat current issues and future challenges. This ensures that you and your employees will always work efficiently with Dynamics AX. Does it take long to generate reports in your Dynamics AX solution? Do your jobs fail to finish on time or do they sometimes stall? Do you experience slow response times, login problems or breakdowns? This indicates that your Dynamics AX solution does not work optimally. ENAVATE's Business Care is a group of services that measure your Dynamics AX in a number of areas and make it easy to identify the underlying reasons of current problems and handle any challenges at an early stage. This ensures that your business will reap even greater benefits from the investment in Dynamics AX. Click here to learn more about out our entire System Optimization Suite offering. Monitor the ongoing performance, capacity and availability of your entire system & infrastrucutre.